In a large skillet, melt butter over medium heat. Cook onion and celery until translucent and soft, 10 to 12 minutes. Add bell peppers, and cook 4 to 6 minutes more. Add garlic, Old Bay Seasoning, salt, and pepper, and cook just until fragrant, about 1 minute. Transfer onion mixture to a large bowl, and add 1/4 cup Parmesan, mozzarella, lemon juice, Worcestershire, eggs, 1/4 cup bread crumbs, crab, and crawfish. Mix to combine well. Divide mixture evenly among mushroom caps, and press firmly. 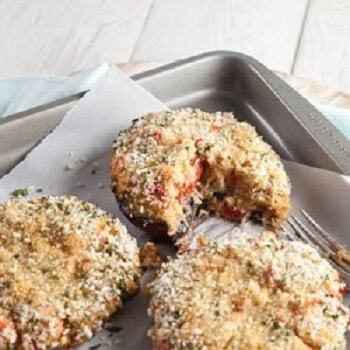 Top mixture with remaining bread crumbs, remaining 1/4 cup Parmesan, and parsley. Place on prepared baking sheet, and bake until lightly browned, 15 to 17 minutes.